Back when vinyl was a viable musical format, instead of something you hung on your wall, there used to be a thing called a multiple groove. When you dropped the needle onto the record, it chose one of two (or more) paths, each containing a different recording. Kate Bush did it on her Sensual World 12” – fans either got a vocal version or an instrumental, apparently at random. M’s Pop Muzik had a double groove with an entirely different song (M Factor) as the alternative cut, allowing the label to say it came with “the B side on the A side”. In the regimented zeroes and ones of the iTunes era, there's no real equivalent of the multiple groove – but I’ve just come across a song that sounds like two songs being played at once. And I mean that as a good thing. 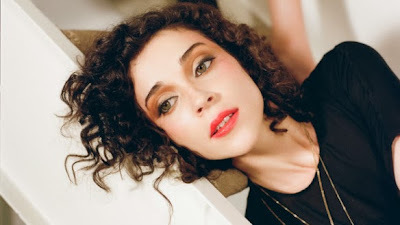 Birth In Reverse comes from Texan singer St Vincent, who’s been refining her home-brew of brain-melting guitars and off-kilter rhythms over three albums. Her fourth has been recorded with the help of Homer Steinweiss, drummer for the Dap-Kings (and therefore Amy Winehouse), giving it an earthy, funky edge that’s previously eluded her. "I knew the groove needed to be paramount," says St Vincent, who’s neither a real Saint nor a real Vincent (she’s called Annie Clark). "I wanted to make a party record you could play at a funeral." Accordingly, this would sit well next to Arcade Fire’s Reflektor on your end of year playlist. Recommended. If you're reading this in 2014, you can get a free download of the song on St Vincent's website. Otherwise, just buy the album (if such a thing still exists).